Mother’s Day is less than two weeks away! (Make a note on your calendar that it falls on May 13th this year.) So, it’s time to get serious about “The Gift.” You want to cement your spot as “Mom’s Favorite Kid” and you really need to get this right. Flowers and candy say: “I only remembered your day at the last minute” so, just forget about that. Think special. Think unique. Think something that she will use over and over again and, when she does, she’ll think about what a great kid you are (and forget about that time you borrowed her car and dented the fender!) Moms not only come in all shapes and sizes, they all have their special favorite things. So, depending upon the type of Mom you’ve got, it’s time to indulge Mom on Her Day! For the Hobby Mom. Does your Mom love to paint? Craft? Read? Collect? Would she absolutely love a special place to call her own? Then, it’s time to get her a “She-Shed.” Yes, it’s official. “She-Sheds” (garden/storage sheds) are here to stay. They give Mom privacy and the ability to indulge herself in her own particular passion, whatever it may be. Buy one and then give Mom carte blanche to decorate it any way she wants. You’ll score so many points! For the Night Owl Mom. Does your Mom love to sit outside long after the sun goes down? And, has she been asking for a warm and inviting fire pit forever? And, did you know that, she’s not alone in wanting a fire pit for her home? 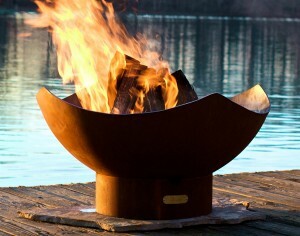 According to the American Society of Landscape Architects, fire pits are the Number One Requested Outdoor Design Item. So, go for it. Light Mom’s Fire this Mother’s Day! For The Entertaining Mom. Is your mom a party animal? Does she love nothing better than to feed and entertain a big crowd? 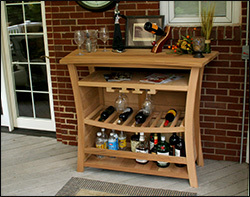 Well, in that case, check out our outdoor buffet tables, bar sets and carts. When family and friends gather, your mom will be all set with food and drink to get that party started. For The Gardening Mom. Gardening can be really hard work! But you can make it easier on mom with a great potting bench that limits all that bending over when your mother has to pot or repot plants throughout the growing season. Our Cypress Potting Table is an outstanding product that will last a long time and make your mom’s gardening chores, well, less of a chore! 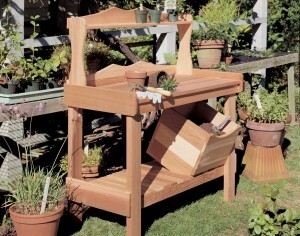 This bench includes a great feature; a bin that will store up to 14 gallons of potting soil just under the main shelf. And, right now, this bench ships for free! For The Nature-Loving Mom. 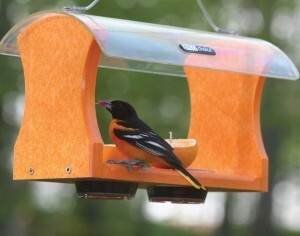 Does your mom love to see the birds gather in your back yard? If so, we’ve got the perfect gift for her. Fifthroom.com has several charming birdhouses, feeders and bird baths which come in a wide variety of sizes and styles which are not only functional, but beautiful, too. Many species of songbirds, both large and small, are drawn to birdbaths to both drink and preen. It’s a great way to make sure that our feathered friends have a clean source of water, particularly during the hot summer months. For The Sun-Loving Mom. Sometimes all a mom wants to do after a busy day is to stretch out and soak up the sun in the most comfortable place possible. For Sun-Loving Moms we’ve got a wide variety of chaise lounges, chairs and ottomans and deep seating sets which will fit the bill oh-so perfectly! For The Outdoor Designer Mom. 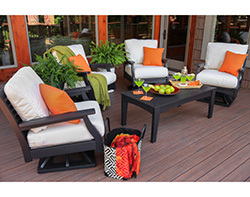 Does mom like to design and redesign your outdoor space? Does she always have a “new project” in the works? 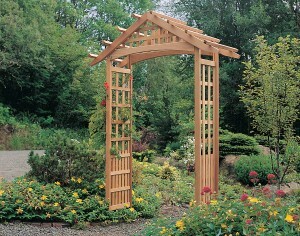 Then we have an idea for a “big gesture” present this year; a sensational pine or cedar arbor. Arbors make a great statement in your yard or garden, as both a entranceway or a pass through to a different area. We’ve got over 30 styles to choose from and they all ship totally free! Mother’s Day will be here sooner than you think. No matter what kind of mom you’ve got, we’ve got the kind of gift she’ll treasure forever, right here at Fifthroom.com.